GB WhatsApp is one of the best modded WhatsApp version available in the market. Due to the modification of the official WhatsApp, GB WhatsApp offers for more features and tweaks compared to official WhatsApp. There are various most wanted features by users are available in GB WhatsApp. One of these following features of GB WhatsApp is the ability to see online friends without getting inside their chat inbox. 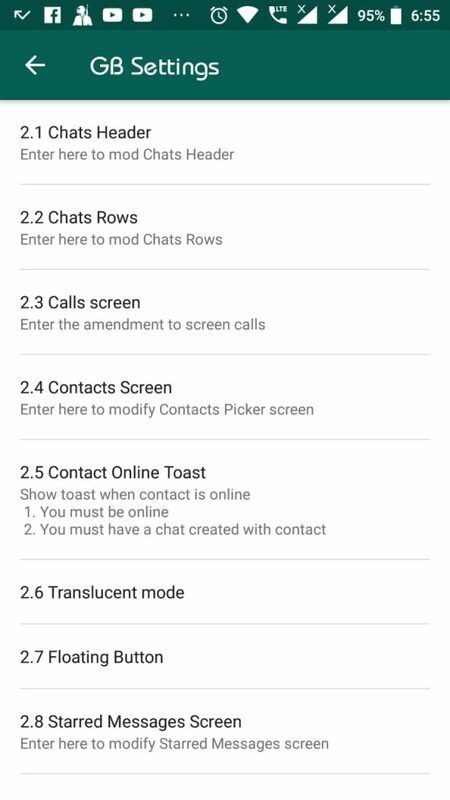 By default, seeing online friends toast is not enabled in the GB WhatsApp. So we have prepared day complete guide to enable the seeing online friends on GB WhatsApp in any Android devices. There are several more features and tweaks available in the GB WhatsApp. We have also listed a few of the key features of the GB WhatsApp in this article. These are the few of the key features of GB WhatsApp which it will be offering to you after you install it in your Android device. Read the features carefully and then head to the guide to enable the see online friends on GB WhatsApp in Android devices. Ability to see the online status on GB WhatsApp. Ability to send more than 30 photos with the help of GB WhatsApp, 30 photos is the limitation of the official WhatsApp which you can send at the same time. 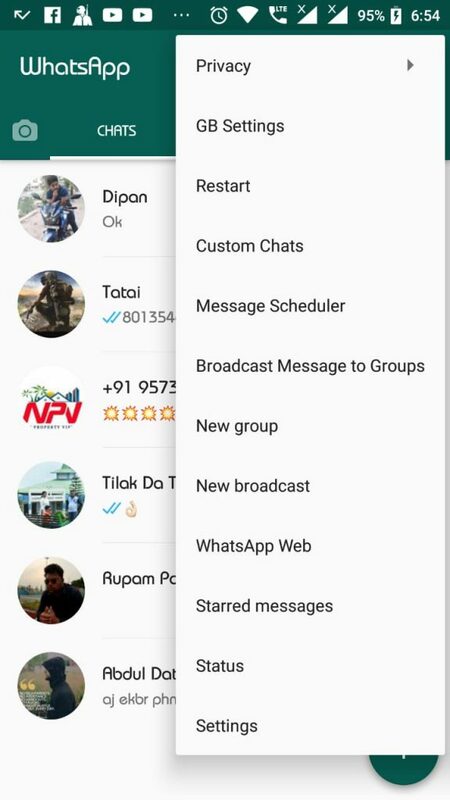 Set and use custom themes in GB WhatsApp. There is multiple language support available in the GB WhatsApp for Android devices. 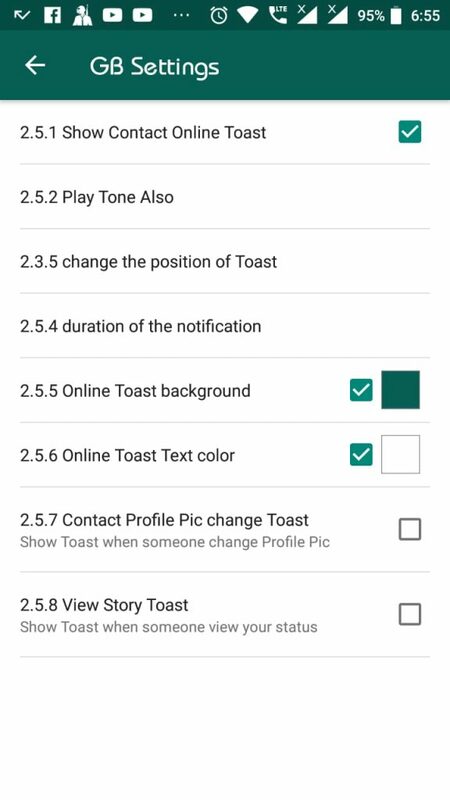 Use this following guide to see online friends toast notification on GB WhatsApp. This is one of the most important and most wanted features available in the GB WhatsApp. Once the GB WhatApp opens up, tap on the three vertical dots on the GB WhatsApp from the top right corner to open the menu of the GB WhatsApp. Now from the drop-down menu tap on the GB settings option and go to Chats. Now on the GB settings page scroll down and tap on contact online toast option. Once the contact online toast settings open up, select the checkbox next to the show contact online toast option. Now get back to the homepage of the GB WhatsApp app and you are ready to go. Once any of your contacts comes online on WhatsApp, you will get a toast notification about that person came online. In any case, the toast notification of the show contact online is not working, you simply need to relaunch the GB WhatsApp and you are good to go. We have researched on the internet about the getting contact online toast on GB WhatsApp. We have also provided the step by step guide to successfully enable the show contact online toast on GB WhatsApp. Share this article with other GB WhatsApp users so that they can also enjoy this useful feature available in the GB WhatsApp. This is one of the features which does not need to open the chat box of any particular contact to see them online.